Polyester Express knows what it takes to get your Special Event on its feet. This 10-piece show band will set the stage on fire with a Big Horn Section, Costume Changes, Choreography, and lots of Audience Interaction. Whether your event calls for a formal dinner set, swing, motown, dance contests, 1970’s theme, prize giveaways, company interaction, or you are just looking for head-turning entertainers — you’ve come to the right place. 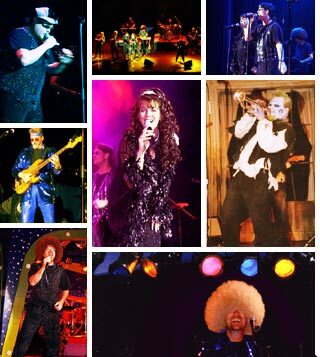 Polyester Express has performed at some of the finest Events Worldwide. They’ve also been nominated for “Best Band in San Diego” by the People’s choice Awards. Polyester Express is a group of unequaled performers committed to fun, and music. They absolutely love what they do, and will always take a sincere interest in assuring that your event will be their finest show ever.